Chief Guest Mr Narayan Prasad Bhatta, Chief District Officer, Chitwan giving his inaugural remarks. 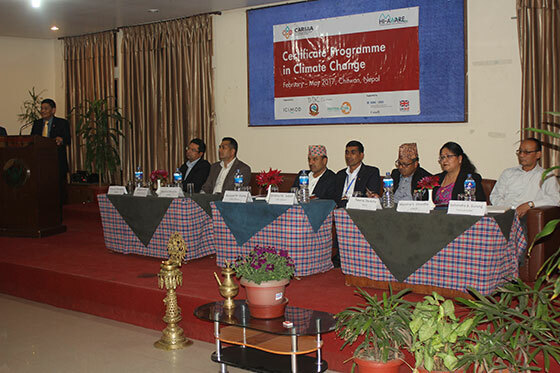 To address the growing challenges of climate change and disaster risk reduction, 70 district officials in Chitwan district are gathered on 14 February to begin a four-month long certification programme in climate change. The certificate programme has been organized by the Chitwan District Development Committee, Government of Nepal with technical support from Practical Action and the International Centre for Integrated Mountain Development (ICIMOD) from February to May 2017. Nepal’s mountainous topography makes it particularly vulnerable to the effects of climate change, such as increasing temperatures, accelerating glacier melt, and a rising incidence of floods and landslides. Chitwan is situated in the Gandaki Basin, which has experienced many of the devastating effects that climate change can cause. Between 2000-2014, more than 1,200 people have died as a result of climate-related hazards. Floods and landslides alone account for 76% of all people killed in the Gandaki Basin over the same time period. Basanta Shrestha, Director of Strategic Cooperation, ICIMOD addresses participants to the course. The certification programme seeks to build knowledge and capacity in district officials, with a particular focus to assist poor and marginalized communities in preparing for future disasters. All participants will receive training in climate related hazards as well as the socio-economic dimensions of natural disaster and on adaptation to climate change and resilience. “ICIMOD is pleased to support the certificate programme to empower district level officials by imparting knowledge and best practices,” said Mr Basanta Shrestha, Director of Strategic Cooperation, ICIMOD. Mr Achyut Luitel, Regional Director of Practical Action, expressed his commitment to continue working closely with District Development Committee to make sure that local people receive full benefits from various programmes. 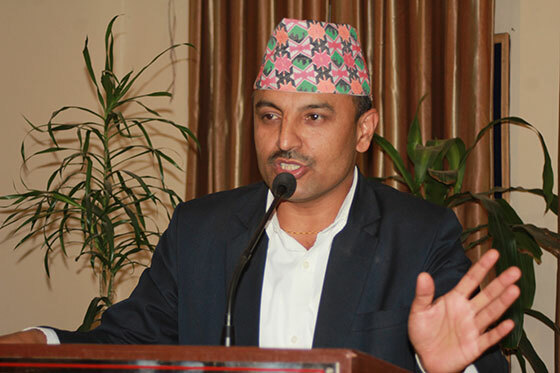 Local Development Officer Mr Krishna Prasad Subedi said in his closing remarks that “all development activities should consider climate change issues.” He praised the certificate programme as a model programme and encouraged the participants to actively interact and make full use of the course. The certificate programme is part of the Himalayan Adaptation, Water and Resilience (HI-AWARE) regional programme of ICIMOD, which aims to increase climate resilience and adaptive capacities of the poor and vulnerable women, men, and children living in the Indus, Ganges, and Brahmaputra river basins. The programme seeks to influence policy and practice by using the findings from research and pilot interventions to improve the livelihoods of people. HI-AWARE plans to extend this certificate programme to other areas in Gandaki basin after the Chitwan programme concludes.